Anyone out there familiar with the works of the French director Jean Rollin? He's made numerous maddening horror flicks from the late 1960's through the 1990's. They are very difficult and artsy at times but they are always entertaining and beautiful to watch. 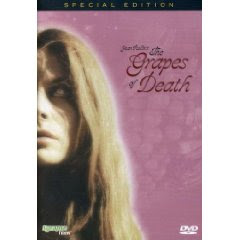 THE GRAPES OF DEATH came out in 1978 and it is a masterpiece of psychological horror.....and it is also a great zombie movie. The premise is very simple: the pesticides used by a local winery are turning everyone who drinks the wine into zombies. The way the director Jean Rollin takes this simple concept and turns it into such a poetic movie is not so simple......it is breathtaking! The STYLE is what makes this movie. Jean Rollin directs a little like Dario Argento.....the difference is, where Argento uses shock tactics and weird lighting and strange music to get to you, Rollin uses space and silence. It is almost like a Sergio Leone Spaghetti Western.......the beauty of the cinematography and the atmospheric noises that are going on the background(footsteps, doors opening and closing, wind blowing, rocks crumbling, etc.) build the suspense......the soundtrack is almost non-existent. And the dialog is sparse as well. Jean Rollin is a strong visual storyteller. So on with the movie. The main character is Elizabeth. She's on a train to see her fiance at his winery in Roubelais. A zombie boards the train and she narrowly escapes her death. Right then, the movie puts you in her shoes, and you are just as confused as she is. She runs to a nearby village looking for help. What she finds is terrifying....a zombified husband who has killed his wife and is holding his slowly turning daughter prisoner. The daughter wants to help Elizabeth get away, but her father stabs her in the chest with a pitchfork before she can. Elizabeth finds a gun, makes it out alive, and takes off to the remote hillside. She has no human contact. Every village she comes to is in flames. Every person she finds has been gruesomely murdered. Zombies are everywhere. I strongly recommend this one.......as long as you're ok with reading subtitles, you'll love it!